This is the only crepe myrtle in our yard. We planted it a few months after moving in, replacing a rather ugly weeping cherry tree that was shaped and growing poorly. 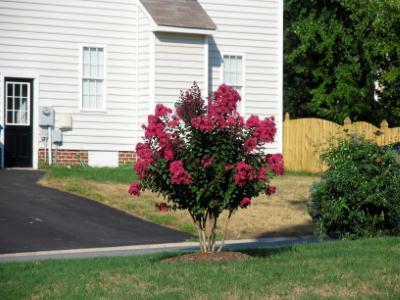 Crepe myrtles are common in Virginia and when they bloom, they are gorgeous. The colors vary from bright pink to light pink to white to a lilac color. This one will not grow very tall, but it is already putting our profuse blooms for our enjoyment each year. Word for tomorrow – FAITH. If you prefer to work ahead, see the list for the week under “A Word A Day”.